Abdullah Abdullah has ruled out a power-sharing agreement with Hamid Karzai. Kabul, Afghanistan (CNN) -- The main challenger to Afghan President Hamid Karzai Monday demanded the removal of the country's election chief and 200 other staffers of the election commission to ensure a fair runoff election. Abdullah Abdullah also called for his supporters to be allowed to monitor polling stations and to observe vote counting and meetings of the country's Independent Electoral Commission. Polling stations which his supporters cannot monitor for security reasons should be closed, he said. And provincial officials in areas where fraud was committed should be fired immediately, he insisted. Abdullah, who was second to Karzai in the first round of voting on August 20, declined to say he would boycott the second round, on November 7, if his conditions were not met. "These conditions are not that difficult, and I have thought about the lawful and legal issues of all conditions," he told journalists at a news conference. Karzai told CNN last week Afghanistan "must have a second round" of voting. "If we don't do that, we would be insulting democracy. And I pledge to respect the vote of the people." Karzai said in an exclusive interview for the "Fareed Zakaria GPS" show that aired Sunday on CNN. Abdullah plans to submit his terms to the U.N. Assistance Mission in Afghanistan and the country's Independent Election Commission -- and give them until the end of the month to comply, he said. Abdullah has long called for the removal of the head of the election commission, Azizullah Lodin, contending he is aligned with Karzai. On Monday, he reiterated his demand, saying Lodin has "no credibility." He also called for three government ministers to be suspended until after the election. Election monitors working for Abdullah were not let into polling stations in the first round of voting, but the U.N., European Union and Independent Election Commission sent observers. The outside bodies are planning to send monitors for the second round, but in smaller numbers. 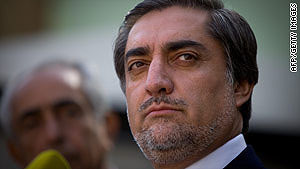 Abdullah, who served as foreign minister in Karzai's government until quitting nearly four years ago, ruled out a power-sharing option with Karzai. "My trust in becoming a candidate was not to be part of the same government, part of the same deteriorating situation," Abdullah told CNN in an interview broadcast on Sunday's "State of the Union With John King." "Mine was for a change in this country. Mine was for bringing hopes for the people of this country, and making the people of Afghanistan true participants in their politics, in the governance, in the developmental process, in the security situation and as a whole." Abdullah and others charged massive fraud in the August 20 vote. The initial results gave Karzai an outright win, but a subsequent review by the U.N.-backed panel of election monitors threw out nearly one-third of Karzai's votes because of "clear and convincing evidence of fraud." Karzai insisted in his interview with CNN that while there were "mistakes" and "some incidents of fraud" in the election, "the election as a whole was clean." He confirmed that many world leaders called and asked him to accept that he had not won enough votes in the first round to be declared the victor, but he said those requests weren't the reason he accepted the runoff. "It was recognizing that Afghanistan had gone through so many years of difficulty, so many years of internal strife backed by foreign players, and I felt as if Afghanistan was entering that period again," he said. "For that reason, and for the reason of safety and security of the Afghan people and as I mentioned earlier, cementing democratic traditions in Afghanistan, I went to agree to a second round." He said he believes another round of voting "is good for Afghanistan... will eventually be good for all of us," he said. At the same time, Karzai said, the "last election was not as bad as it was claimed -- it was a lot better." "To call this as clean elections, I think this, with all due respect to Mr. Karzai, it's a bit of ignorance," he told King, adding that "unfortunately, the government was involved."